You’d be amazed at how many famous people claim to have seen a UFO. Below we present just a small sample. Very appropriately there are stories that William Shatner, who played Captain James T. Kirk in the television series Star Trek, may have seen a UFO and perhaps even have been abducted by its occupants. Author Dennis William Hauck wrote an unauthorised and somewhat critical biography of Shatner, called Captain Quirk, in which he portrayed Shatner as an arrogant and unpleasant individual, disliked by his fellow members of the Star Trek cast. Hauck believes that Shatner had a life-changing experience, however, when he was abducted by aliens in the Mojave desert. Shatner was supposedly riding his motorcycle with some friends through the desert but somehow got separated from them. His bike broke down, and he walked for miles to find a petrol station. 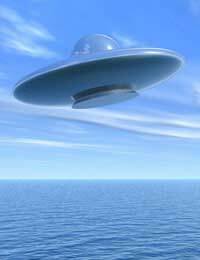 When he found one, he noticed that there was a flying saucer hovering over it. Then things started to get hazy and the good captain may have been taken aboard. Comic legend Dan Aykroyd - of Ghostbusters fame – is fascinated by UFOs. He once hosted a television programme devoted to it and is known to support UFO research organisations such as MUFON (www.mufon.com). In the DVD Dan Aykroyd Unplugged, he speaks quite candidly about his views on the subject. Although he doesn’t claim to have seen a UFO himself, he thinks he may have spotted some Men in Black once, while on the phone to Britney Spears! Another actor and comedian who had some ET experiences was Jackie Gleason – you may know him as the Sheriff in the Smokey and the Bandit films, or as the master pool-player Minnesota Fats in the Paul Newman classic The Hustler. Gleason was a good friend of U.S. President Richard Nixon and, one day, while the two were playing golf together, the subject of UFOs came up. Nixon said little at the time but, later that day; he took Gleason with him on a special visit to Homestead Air Force Base. There, Gleason allegedly witnessed dead extra-terrestrials. Gleason’s wife told the full story in an interview with Esquire magazine. You wouldn’t expect many politicians to come clean about having seen a UFO. After all, it could damage their credibility. But, interestingly, quite a few have admitted it, including some prominent ones. Former U.S. President Jimmy Carter says he saw a UFO while he was the Governor of Georgia. For about ten minutes, he and a group of others watched some weird lights in the sky that seemed to approach them then recede. Carter mentioned the sighting a few times on the campaign trail, and when he was sent a UFO sighting report by a research organisation, agreed to fill it out. While campaigning to become President, Carter promised to reveal all the U.S. government’s UFO secrets if he was elected. He was; but no secrets emerged. Carter’s successor in the White House, Ronald Reagan, also allegedly saw a UFO while he was the Governor of California. Reagan was travelling in a small plane when he noticed a strange light which seemed to be following the aircraft. The light accelerated a little ahead and, at Reagan’s suggestion, his plane pursued it for a few minutes before it zoomed away vertically at tremendous speed. Reagan developed an obsession with extra-terrestrials and mentioned them frequently in his speeches. Once, in a speech to the UN, he even said that the United States and the Soviet Union might be forced to make common cause if Earth faced an extra-terrestrial invasion. According to Michael Luckman, author of Alien Rock: The Rock and Roll Extra-terrestrial Connection, quite a few famous musicians have had UFO experiences. Craggy-faced rocker Mick Jagger is said to have seen two UFOs in the course of his life. One, a cigar-shaped “mothership,” appeared in 1968 while he was camping in Glastonbury with then girlfriend Marianne Faithfull. The other allegedly hovered over the audience while he was performing a gig in California. If Michael Luckman is to be believed, Jagger even had a UFO detector installed in his home. Jagger couldn’t get no satisfaction, though, because it kept going off, whenever he wasn’t in the house! John Lennon saw a UFO at his apartment in New York with his girlfriend May Pang. The object was cone-shaped, but flattened at the top, crowned with a steady red light, and featuring a row of smaller, pulsating white lights. It drew close to the amazed couple in their 17th floor apartment before passing on by. They managed to take some photographs of the object but all came out over-exposed. UFOs seemed to pervade the life of Elvis Presley. Strange lights were seen in the sky at the time Elvis was born; quite a few were seen around him in his life; and one was allegedly seen hovering over the mourners when his coffin was interred in the grounds of Graceland. Some even speculate that perhaps The King himself was an extra-terrestrial - and not in the coffin at all, but looking down on it from above in the flying saucer! As should now be clear, people from all walks of life, from drug-addled rock musicians to sombre politicians, claim to have seen mysterious objects in the sky. Some even developed a private obsession with ETs which, for the most part, was completely unknown to the general public. I've seen ufo's on 9 different occasions. From 1967 to the last sighting in 2016. They are 'out there' as is the truth! Bring in Scully and Moeller back!